The mighty Swedish metal outfit Entombed are back with a twin disc release that finds the band as hostile as ever. On Inferno, the sheer rawness of songs like "The Fix is In" could peel paint off a wall, while tracks like the rumbling "Incinerator", the doom-infused "Nobodaddy" and the bombastic "That's When I Became a Satanist" contain subversive grooves underneath the wall of churning guitars. These days, the band is sounding like the perfect mix between COC and Sabbath, and since its inception in 1987, Entombed have always been unafraid to change it up without sacrificing the sledgehammering. 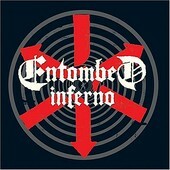 In all, Entombed prove that by keeping it visceral and heavy, you can still be at the top of the extreme metal genre.